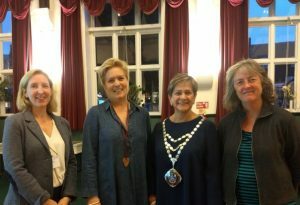 As a result of their long standing research partnership with Poole Museum, Dr Holly Crossen-White and Dr Anglea Turner-Wilson were invited to preview a new exhibition last Friday attended by the Mayor of Poole, Councillor Lindsay Wilson and Councillor Mohan Iyengar Cabinet Member for Economy, Culture and Learning and Community Engagement. 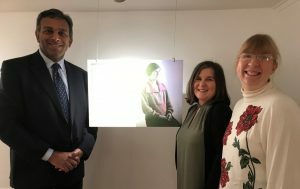 The exhibition, Her story: Tales of Poole Women Past and Present ​ was inspired by International Women’s Day and features two women associated with Bournemouth University. Firstly, Jean Tocher who served as a WREN in the Royal Naval Intelligence Section at Bletchley Park during World War II and in later life worked at Bournemouth University as a Careers Advisor. Dr Kate Murphy from the Faculty of Media and Communications is the other women to feature in the exhibition. 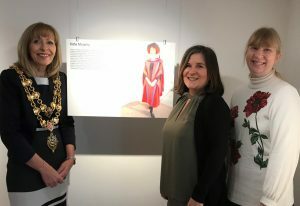 The exhibition highlights the great achievements of women who have a local connection. Visitors to the exhibition are being asked to leave their own reflections about a woman they feel has had a significant influence upon their life. O n Sunday BU and RSPB staff along with volunteers from SUBU enjoyed hearing what young people under 12 years old thought about about being outdoors. The research team welcomed over 60 children to the KingFisher Barn to take part in this ESRC Festival of Social Sciences event. There were various outdoor activities for the young people to try including den building in the woods. Many of the fun activities also gave young visitors the opportunity to share their ideas about the importance of spending time outdoors playing with friends or family. Many of the young visitors added their ideas to the event’s ‘Big ideas Trees’. There was also the chance for them to suggest how green spaces could be improved to make them more attractive as places to play. Not all the data has been analysed yet but it would seem for the under 5’s one popular enhancement to any green space would be more muddy puddles! On Sunday the Kingfisher Barn, Muscliffe will be the venue for an ESRC Festival event. BU staff from the Faculties of Health and Social Sciences and Media and Communications have developed the event in collaboration with the RSPB and Bournemouth Borough Council Parks. The event called Me and my green space is aimed at young people aged 12 years and under. There will a range of activities to help open a dialogue with younger visitors about what they think green spaces are, do they use them during play and if so what type of activities they like to do in the green spaces they visit. The research team is also interested in whether the young people have ideas about improving access to green spaces or any thoughts about how these areas could offer more enjoyment to younger visitors. The activities on offer will be den building, arts and crafts based on natural materials, an arboretum trail and river dipping. SUBU are helping to support the delivery of several of these activities. The event will end with a lantern trail to light up the woodland area around the Kingfisher Barn. All the research team – Holly Crossen-White, Angela Turner-Wilson (HSS), Annie East and Nathan Farrell (FMC) – invite you to come along and enjoy some outdoor fun – and the weather is going to be good too! Last week, Prof Ann Hemingway, Prof Adele Ladkin and Dr Holly Crossen-White joined European research colleagues in Ostend, Belgium for a SAIL Project bi-annual team meeting. 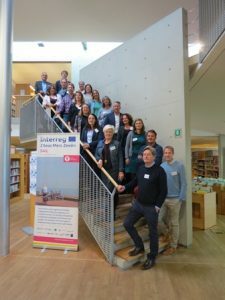 Over two days all research partners from four different European countries had the opportunity to share their initial research data from pilot projects being developed within each country for older people. The BU team will be undertaking the feasibility study for the SAIL project and will be drawing together all the learning from the various interventions created by the other partners. Yesterday the Life by the River Team welcomed over 130 guests to their Festival of Learning Event at the Kingfisher Barn next to the River Stour near Throop. 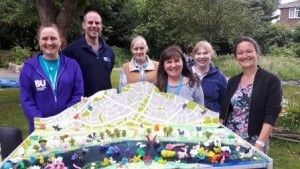 The event was development by Holly Crossen-White and Angela Turner-Wilson from the Public Health Cluster in partnership with Tom Clarke from the RSPB and staff from Bournemouth Borough Council Parks. 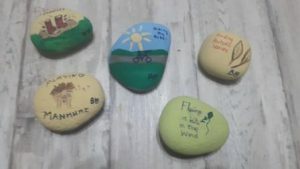 The aim of the event was to encourage the public to consider the health and wellbeing benefits that can be gained by spending time enjoying the natural environment. Of those who completed an evaluation form 63 % of visitors had never been to this stretch of the River Stour before and all said they planned to return. The Team received lots of positive feedback about the event with visitors saying ‘there was a brilliant atmosphere’ , ‘really relaxing’ and ‘lots of fun for everyone’. Members of the Public Health Cluster have been working in partnership with Tom Clarke from the RSPB over the last two years to to promote to the public the many health and wellbeing benefits there are from spending time outside enjoying the natural environment. The Team has also been working with Bournemouth Borough Council, Parks staff and supporting the development of a project based on a stretch of the River Stour. Heritage Lottery funding had enabled the creation of the Kingfisher Barn, a new visitor’s centre alongside the River Stour, near Throop. To showcase the work the project team Holly and Angela (BU), Tom (RSPB) and Bournemouth Parks staff have developed a Festival of Learning Event at the Kingfisher Barn with lots of outdoor activities for visitors of all ages. There will be an opportunity to discover how previous generations have lived their life by the river and there will be some lovely family photos showing how life was that have been generously provided by local families who have also shared their memories and helped Holly bring together the exhibition. There will be some messy things to do too so maybe pack some wellies if you would like to help create a cobb structure with Heidi a local artist who has been working with the Team. 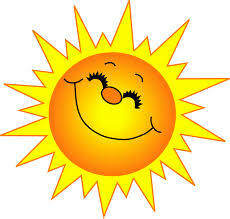 The event is this Sunday – 26th June at the Kingfisher Barn between 11am and 3pm. 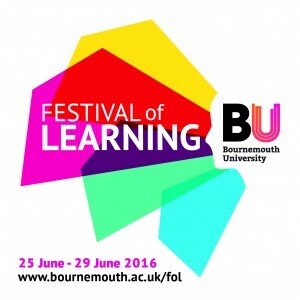 One of the events at this year’s BU Festival of Learning will highlight the research partnership between BU and the RSPB. For over two years members of the Faculty of Health and Social Sciences have been working with Tom Clarke from the RSPB on various projects that explore how accessing the natural environment can improve personal health and wellbeing. 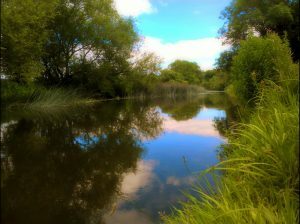 The Festival of Learning event that is being developed in partnership with the RSPB will focus upon one stretch of the River Stour between Muscliff and Throop Mill. An exhibition, at Bournemouth Council’s new Kingfisher Barn Visitor Centre, will show how previous generations have used the area. It is hoped that through this historical narrative members of the public who visit the event will be encouraged to think about how they could enjoy this beautiful rural stretch of the river with family and friends in the future. There will also be cultural heritage activities to try. At present the project team are gathering information on the cultural heritage of the area. 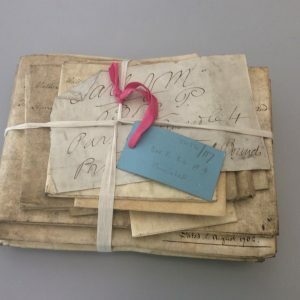 This has involved searching local archives as well as Hampshire Record Office, to find information about those who have lived, worked and had fun in and by the River. The Daily Echo is also supporting the search by including an article asking any members of the public with memories of the area to send them in – and we know there are lots of people with childhood links to the location following a number of Facebook posts to members of the project team. May be colleagues or students at BU have their own memories they’d like to share – we’d love to hear them! Last week Jane Senior from University of Manchester and Research Project Manager of the Offender Health Research Network (OHRN) visited Bournemouth University. She came to BU to share her recent research findings with students, staff and professionals working with prisoners and ex-offenders. These large-scale studies have been undertaken in collaboration with a number of UK Universities and also Columbia University, New York. Those who attended particularly enjoyed having the opportunity to discuss with Jane the implications for her findings for professional practice now and in the future. One attendee said the session ‘was excellent – very interesting and engaging’ and another ‘ I really enjoyed the format of the session – so informative’. The critical Time Intervention is on-going research project and several of the professionals attending the session felt was a great opportunity to learn more about this new pilot initiative. The session was made possible through funding from the Society and Social Welfare Community. A special event has been arranged at BU that will focus on health care within prisons. The session to be held on 28th May will be led by Jane Senior from the University of Manchester. Jane is a clinician-researcher and Research Project Manager for the Offender Health Research Network. Jane is a qualified mental health nurse with over 20 years of post qualification experience of working in prison and secure mental health settings. During the session Jane will outline findings from her recent prison research projects. These include studies into how to manage the health and wellbeing of older prisoners and her recent work in developing the Older Prisoner Health and Social Care Assessment and Plan (OHSCAP). She will also highlight some of the specific issues that can arise when undertaking research within a prison environment. Staff and students are welcome to attend the session. If you would like to attend please email Holly Crossen-White (hcrossen@Bournemouth.ac.uk). Exploring digital archives with pupils from St Katharine’s School, Southbourne. 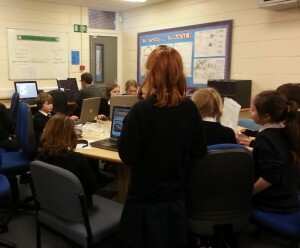 Last week I spent time at St Katharine’s School, Southbourne helping Year 5 pupils learn about digital archives. The school is involved in the ‘Be the best you can be’ programme which focuses on helping young people discover their unique potential. The programme was launched at the school last autumn with a visit from the Olympic athlete Mark Richardson who spent time with each class talking about what it takes to compete for your country. The sessions I led were part of a week long programme of activities and learning opportunities for pupils. Other sessions were led by a graphic designer, a chef and a BBC News journalist. The sessions were not just about learning a new skill but also a chance for pupils to find out more about the skills and expertise needed if you aspired to work in that particular role. I was asked lots of questions about what a researcher does in a university and were else researchers might work. I was also asked why I wanted to be a researcher and what it was like to work in a university. The pupils had never seen a thesis before and asked me why I had done a PhD, why I was interest in that topic and what it was like to work on the same thing for a long time – it was just like being back in my viva! Digital archives were used in my PhD and I really enjoyed sharing with the pupils some of the knowledge and skills I developed during my research. The first part of the session looked at what archives are and what they could tell us about past events or people. I picked digital archives that could be related back to current topics that Year 5 are thinking about and discussing in class. The second half was a hands-on session for the pupils to explore for themselves a number of digital archives that might help them with current and future project work. It was great to work with the pupils and really interesting to see what captured their imagination and there were some surprises! The teaching staff also found the sessions very interesting. Through the sessions they discovered some new learning resources which they are going to build into their future teaching. I really enjoyed taking my university skills and experience out into the local community and sharing them with the pupils and staff from St Katharine’s School. 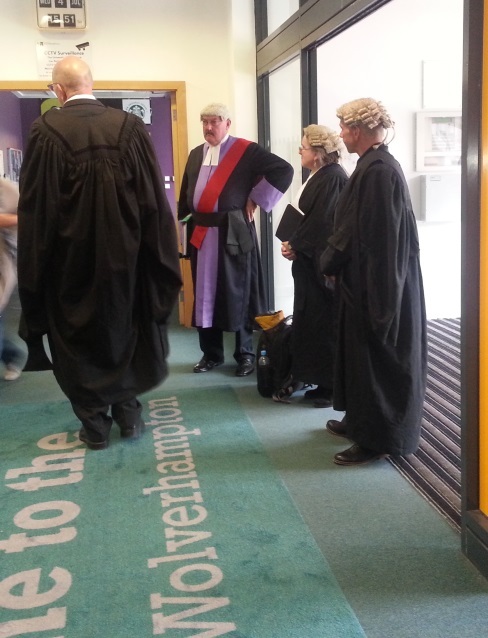 Last week the University of Wolverhampton hosted the annual conference of the British Society of Criminology. The Parellel sessions covered a wide range of topics including policing, prisons, diversity, media and culture and gender. Highlights for me were papers on cyberstalking by Italian teenagers and the development of websites that sell illicit drugs with a specific focus on the techonology behind one site Silk Road. For anyone with a specific interest in prisons and offender welfare some interesting prelimary findings from the largest UK survey of prisoners were presented and this research will be published over the next few months with the first pblication due out at the end of July. There was also a fascinating paper on research into the experience of prisoners that was conducted by a group of prisoner officers who undertook training in ethnographic research and were assigned to research prisons where their status as a prison officer was unknown. The paper focused on the impact that undertaking the research had upon the prison officer researchers. My paper , Exploring female drug-taking during the First World War generated a lively discussion on the female role in drug dealing and law-breaking. It was an excellent conference and I would like to thank Rosie Read for supporting my application to the Society and Social Welfare Community Budget which enabled me to attend.